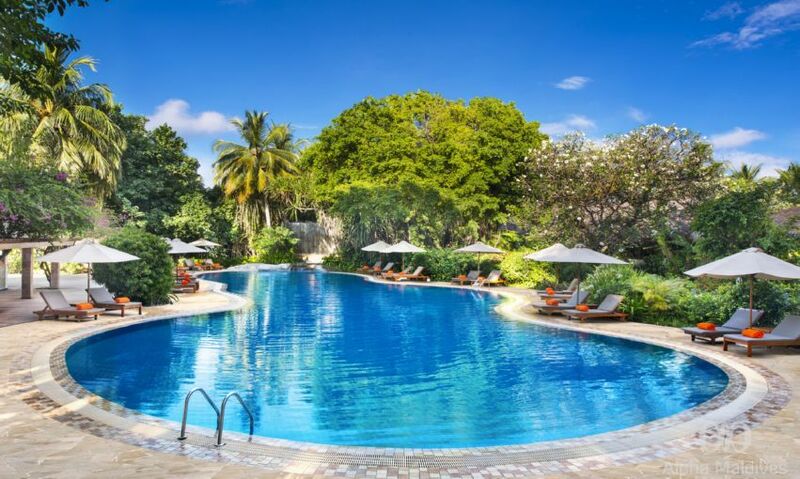 A haven for families and for pure relaxation, Sheraton Maldives Full Moon Resort & Spa is a great holiday retreat with endless choices. A carefree holiday is promised by the friendly hosts of the resort during your stay, so leave your shoes and worries of this world and be yourself for a moment in life. 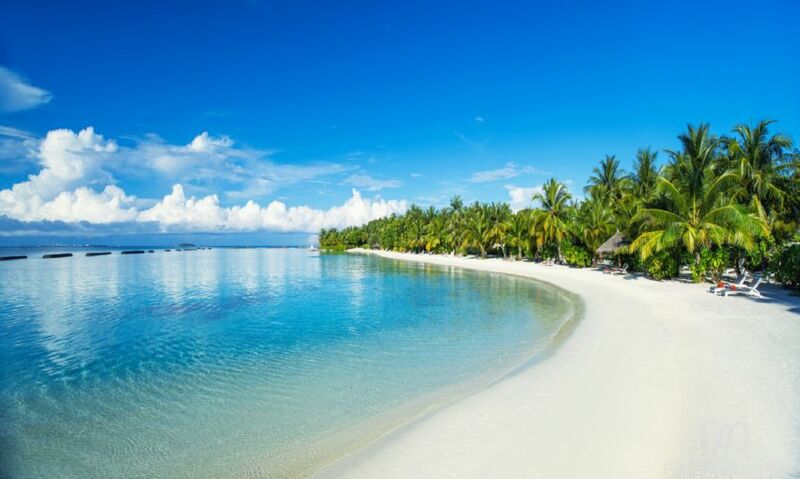 Sheraton Maldives Full Moon Resort & Spa is situated on its own island - one of 250 inhabited isles among the over 1,100 comprising the Republic of Maldives - and is surrounded by tropical turquoise waters and its own lagoon. Conveniently located 15 minutes away from Ibrahim Nasir International Airport by speedboat - so guests will not be inconvenienced with overnight stays in Malé or long waits for seaplane transfers. Fall asleep dreaming of the fun in the sun in 176 guest rooms furnished with tropical accents and designed for comfort, featuring the Sheraton Sweet Sleeper™ bed, 40” LCD TVs, Shine for Sheraton Bath Amenities and more. A spectacular sunrise seen from your spacious balcony or terrace every morning, comfortably adorned with stylish outdoor furniture and set against garden, resort or sea views. 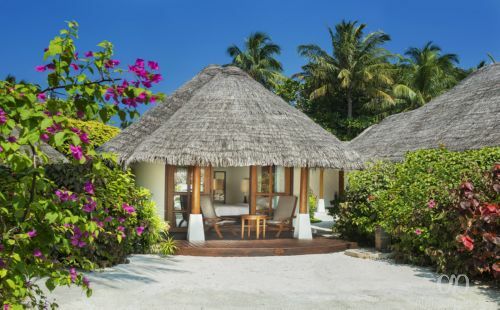 Under a traditional Maldivian roof, settle into the cozy and elegant ambiance of Beach Front Deluxe Rooms designed and built by local craftsmen. Timber blinds and pretty tiled floors complete the tropical setting with individually-controlled air-conditioning and ceiling fans to stay cool your way, and you’ll enjoy the shower and separate vanity in the bathroom. You’re never far from family through interconnecting rooms on the ground floor, while rooms on the first floor open out to private balconies (10 square meters). You’ll find extra space and seclusion all under one thatched roof in the Island Cottages, where you can enjoy each other’s company comfortably. 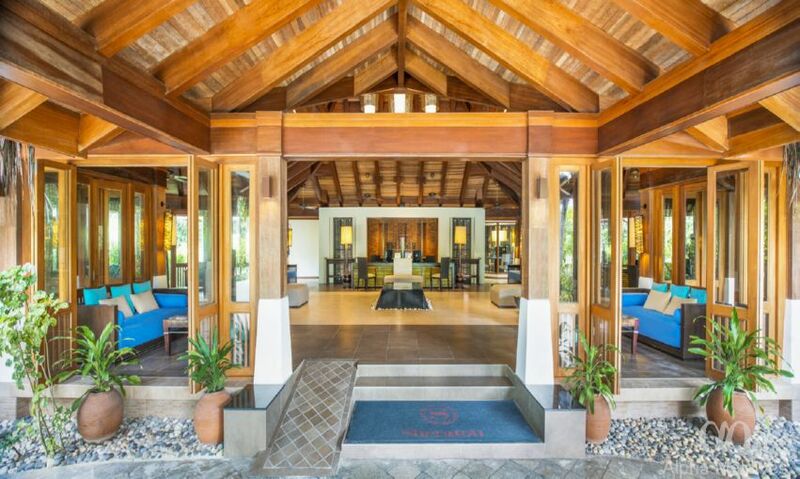 Just steps from the lagoon with refreshing views of lush tropical gardens, it’s a perfect mix of leisure and pleasure. The private balcony features a daybed for the ultimate morning, afternoon or evening of lounging, while a king bed under vaulted ceilings gives you all the room you need to unwind. An open air shower still in the privacy of your cottage or a separate indoor bath for soaking? You decide. Take in panoramic ocean views from a private terrace and take advantage of direct beach access in the Beach Front Cottages, just two perks of resort living everyone can agree on. The bathroom’s outdoor – but still private – shower means you never have to miss a moment of sunshine, while the indoor bath lets you soak in pure relaxation. 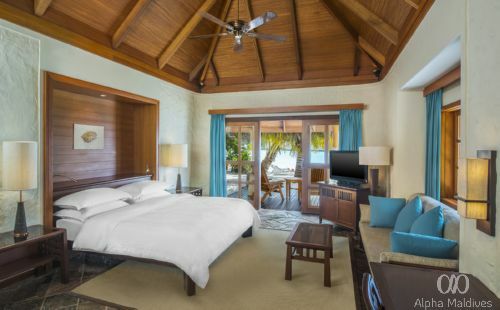 From the king bed under vaulted ceilings to spacious private balcony with daybed, you’ll never run out of room to relax and lounge in true Maldivian style. 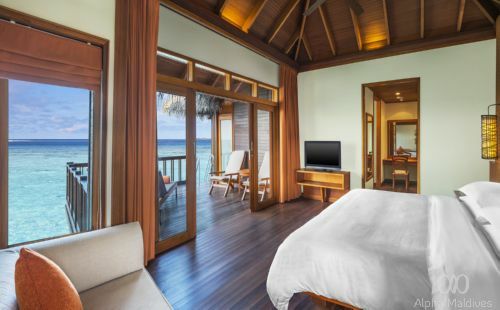 On the northern end of the resort for uninterrupted relaxation and rejuvenation, slip into one of the Water Bungalows where spectacular ocean views are a daily affair. Built on stilts over the lagoon, dipping into crystal clear waters is as easy as going down the steps from your private sun terrace. Or linger there on comfortable outdoor furniture, plenty for everyone to get quality time with fresh air and golden rays. 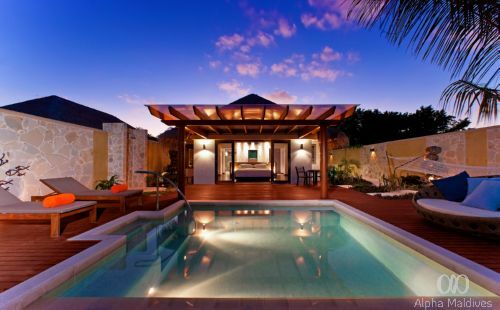 Under the thatched roof indoors, a king bed and daybed set a romantic tone for two. You can continue enjoying Indian Ocean views even from the bathroom, with direct access to the balcony, lighted mirrors, spacious bathtub, and separate shower and toilet. Bigger is better – everyone will agree with the expansive space of the Water Villas, set over the water and under a traditional thatched roof. 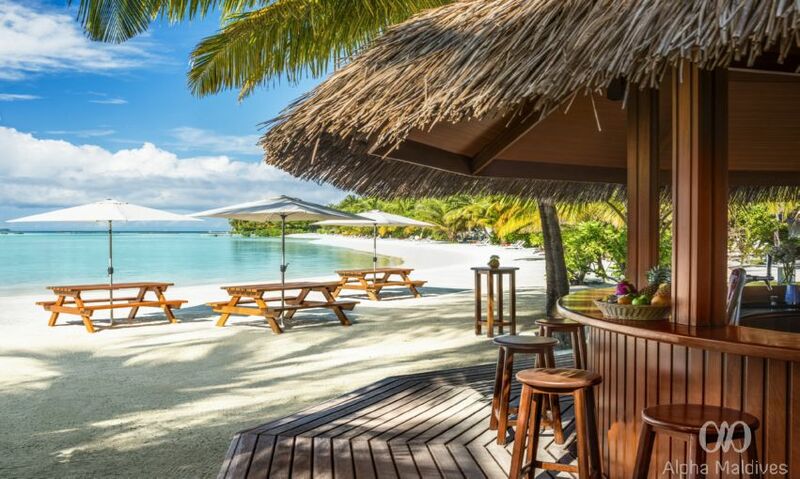 With direct access to the pure turquoise waters of the lagoon and never ending views of the Indian Ocean, the large terrace with sun lounges is the ideal spot for basking in golden sunshine or enjoying time together under the stars at night. A king-sized bed keeps things roomy, and the extra-large bathroom looks out to the sea, provides direct access to the balcony and has lighted mirrors, a roomy bathtub, and a separate shower and toilet. 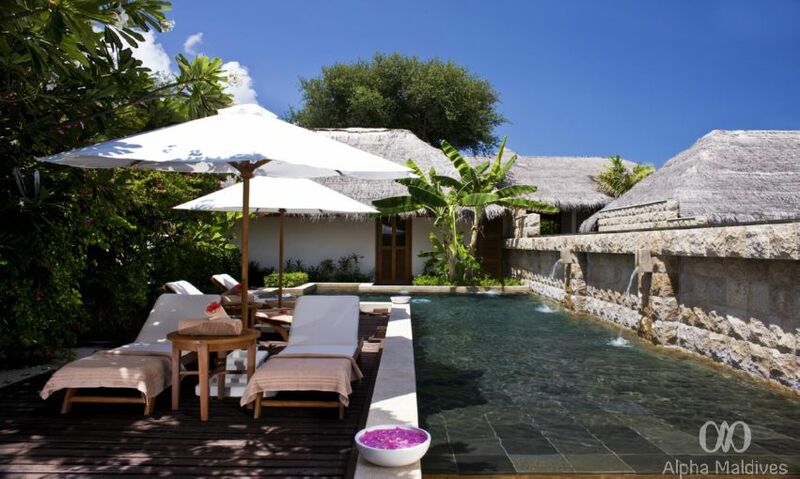 Welcome to the beach house of your dreams, where an outdoor area with its own deck, two plasma TVs and comfortable rattan seating surrounds you with panoramic views of the Indian Ocean. 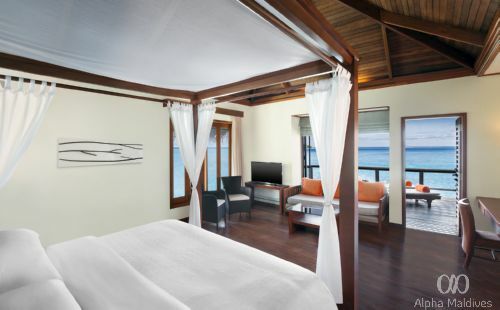 The king bedroom overlooks another terrace with direct access to the sea, filled with sun lounges so you enjoy paradisiacal resort living in the privacy of the Water Suite. An inviting mini-plunge pool is the centerpiece of the bathroom, which opens up to both balconies outside and has lighted mirrors and spectacular views inside. 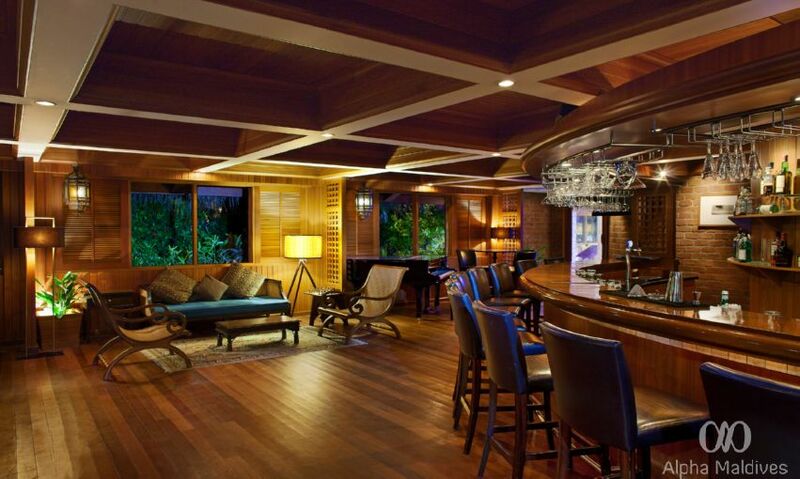 Custom design furnishing tastefully complements traditional styles with contemporary sensibilities. Feast offers a relaxed atmosphere with a resort-style décor which serves a variety of cuisines based on daily themes for dinner. 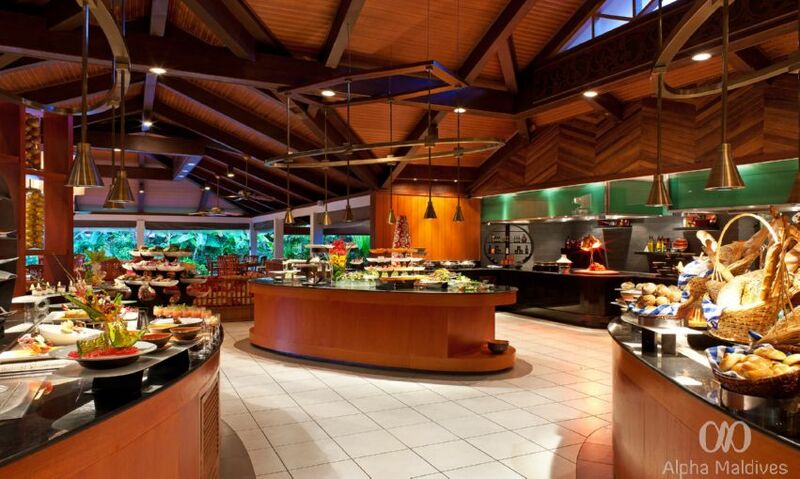 Breakfast, lunch and dinner are served daily and various beverages are available. 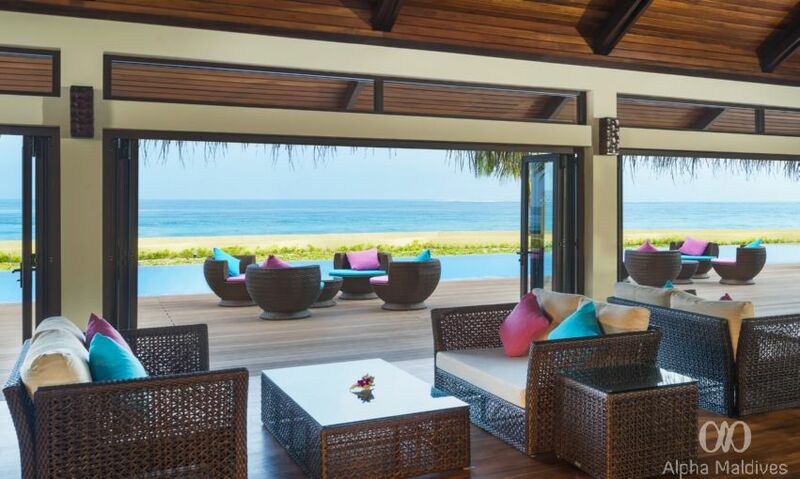 Sand Coast offers guests the simple luxury of relaxed al fresco dining on a deck beside the ocean, or in the cool shade of the thatched roof pavilion. 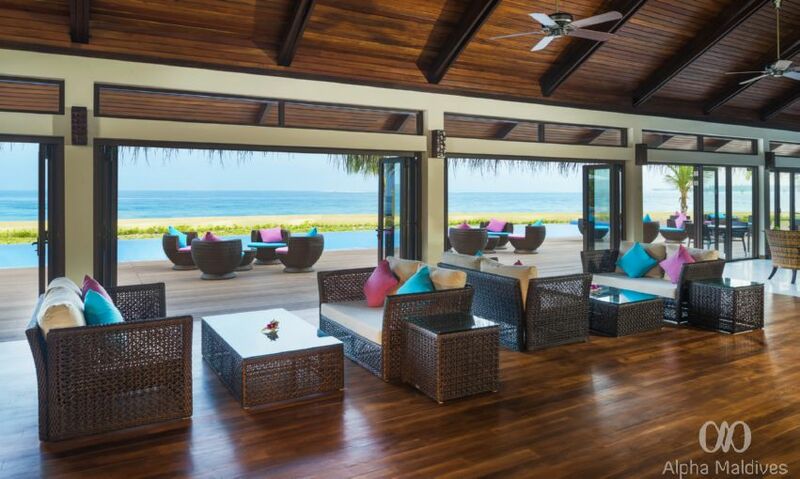 Day or night you may wish to linger here over refreshing drinks, homemade ice cream, or an extensive array of international light snacks and Maldivian fusion main courses. Experience the delights of Thai food with all its variety, taste, and tradition in this contemporary, air-conditioned restaurant. 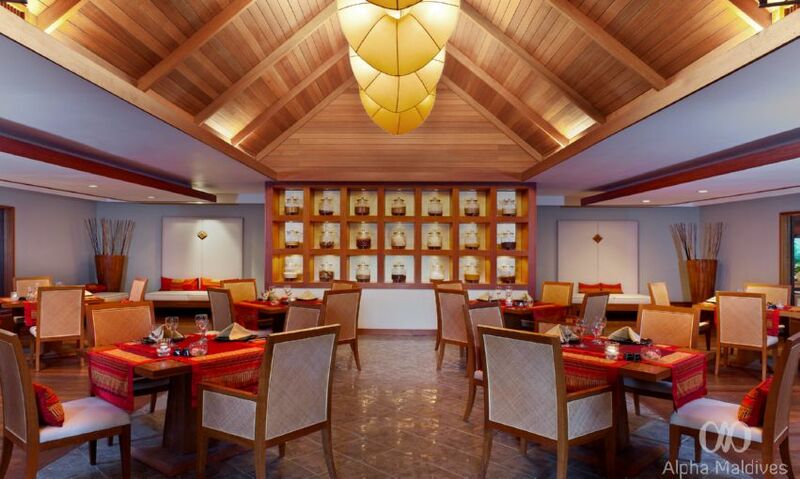 In-house Thai chefs will blend their culinary skills with tasteful innovations to dish out a memorable feast for you. In the classic setting of an English pub with contemporary furnishings, Drifters serves not only drinks but also entertainment and fun. Offering a wide range of perfectly chilled malts to help you wind down after a long, hot day in the sun. 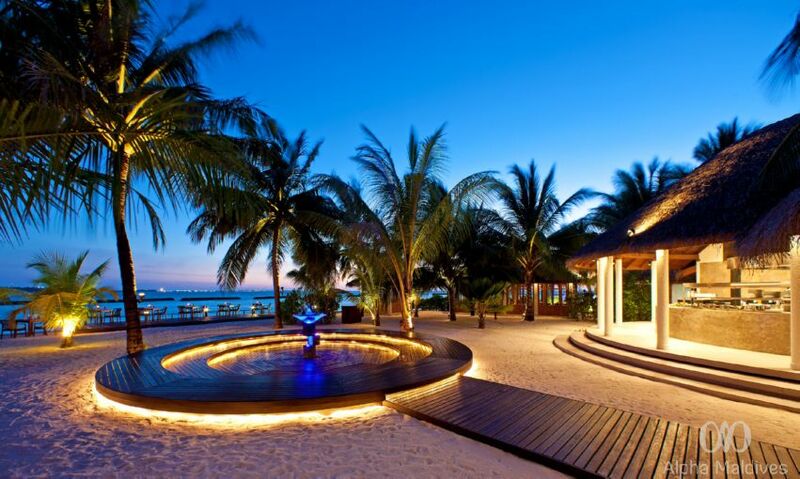 Part of Sheraton Maldives Full Moon Resort & Spa’s appeal is the varied dining options available to guests. From casual al fresco snacks to an international array of restaurants, you will find the perfect dining experience to suit your mood. 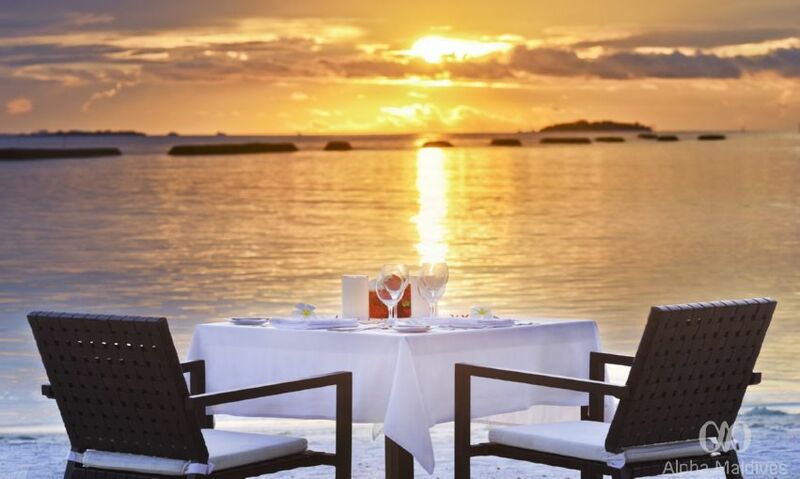 Why not also consider private dining with that special someone under a starlit sky, with soft sand beneath your feet, beside the shimmering lagoon? 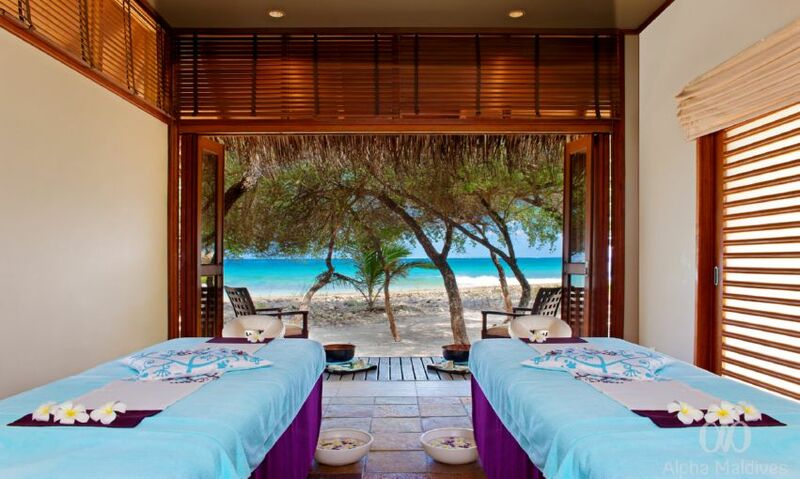 Come and indulge your senses with this unique and truly sensational Shine Spa. With influences from all over the East and the West, combined them into a special treatment experience just for you. Treatments originating all the way from China, Thailand, India, Arabia and the Mediterranean, placing them all within your grasp for a truly magical spa experience. Taking you to faraway places while indulging your senses in subtle hints of beautiful scents. 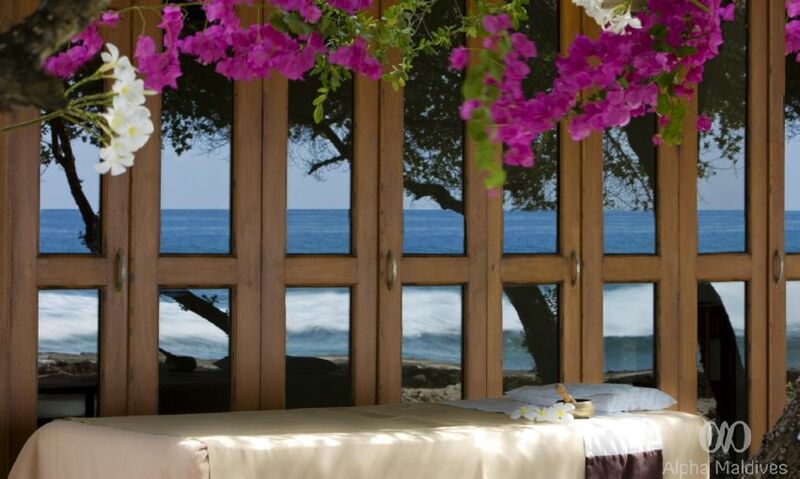 Using an amazing surrounding and environment as a guide, the spa ensures only to offer you the very best in natural products that will enhance your experience and promote the best in well-being and inner tranquility. With a wide variety of treatments to choose from you will find that your holiday may not be long enough to indulge in all the amazing wonders for you! 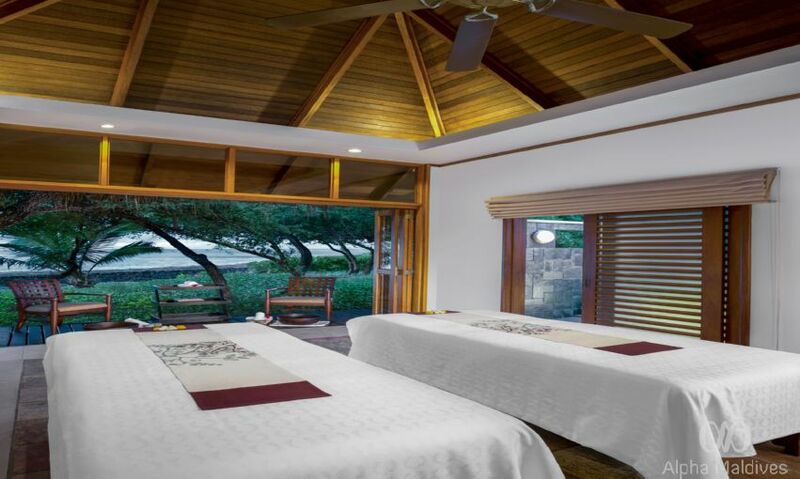 From tranquil massages to luxurious facials and so much more, the treatment menu offers you the best variety to choose from. Please note that all prices are quoted in US Dollars, do not include taxes or gratuities, and subject to change. We also have a 24 hours cancellation and reschedule policy. The SPG Kids Pass program is an all-inclusive dining program created with youngest guests and their parents in mind. For a flat daily rate, children ages 12 and younger of Starwood Preferred Guest® members can enjoy all-inclusive access to a variety of dining options, including children’s menus, buffets (when available), and beverages at select participating resorts. To take advantage of the SPG Kids Pass program, sign up when you check in or anytime during your stay. Travel and fitness go hand-in-hand. Maintaining health and fitness routines while on the road helps make travel more enjoyable; that’s why Sheraton is committed to offering a custom training and nutrition program. Based on the four fundamentals of optimal performance—mindset, nutrition, movement, and recovery—the program takes a holistic approach that is integrated throughout the resort. The state-of-the-art program allows you to maintain and customize your routine. 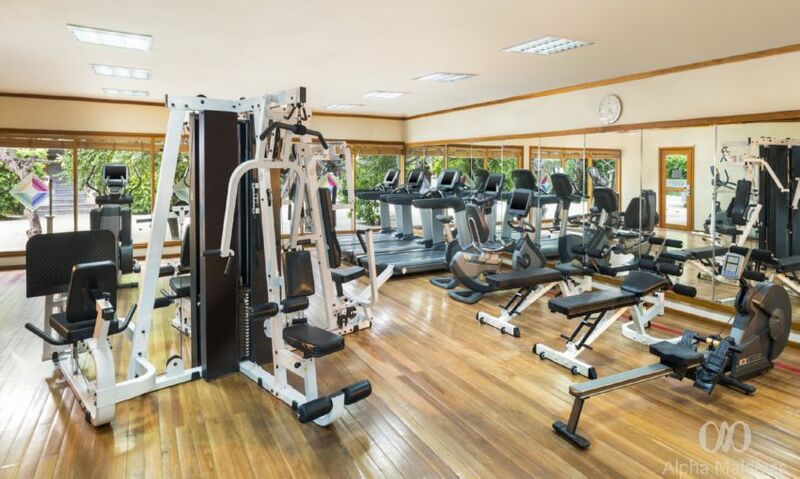 With a range of professional equipment and a qualified gym instructor, you can be sure that your days at the gym will always be productive. See the activities calendar for scheduled yoga and tai chi classes. Head outdoors to play tennis with friends and family, or stay inside for some table tennis. Qualified coaches are available for both. Enjoy the beautiful free form freshwater pool with adjacent waterfall and children's pool. 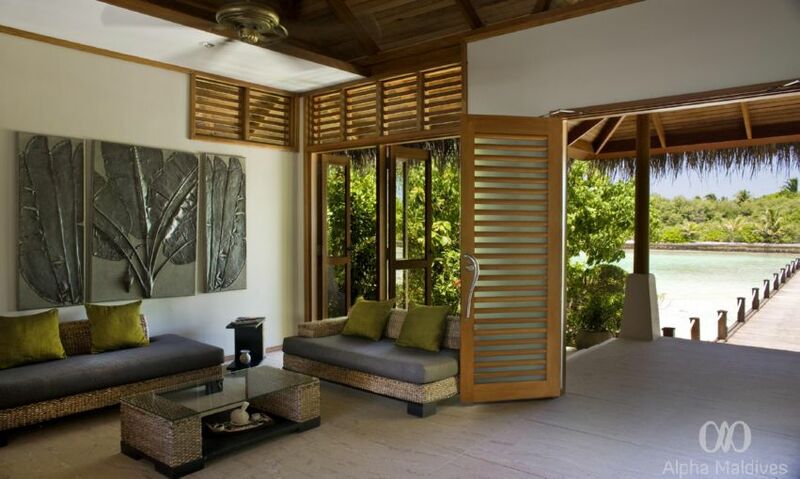 This relaxed tropical oasis is located outdoor in the heart of the resort, with ample sun lounge. Snacks and cool drinks can be ordered poolside. Younger guests—ages 4 to 12—are invited to experience all the fun and games of the Sheraton Adventure Club. 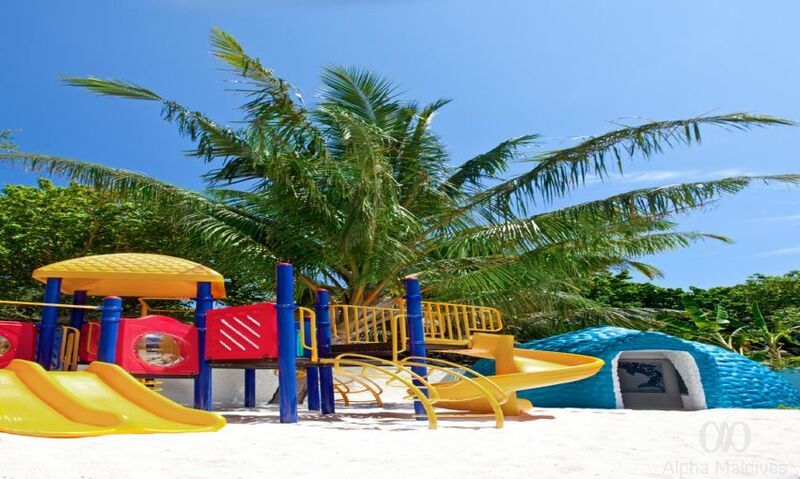 An ideal choice for families, the Sheraton Adventure Club offers a wide array of fun and educational activities ranging from mini Maldivian language lessons to video games to keep children entertained throughout their stay. 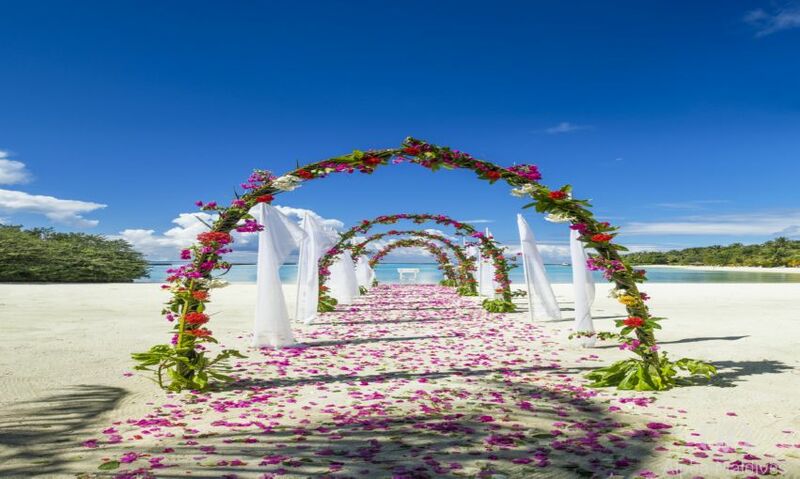 The club offers activities designed to teach the children about the local Maldivian culture through traditional music and dance as well as mini lessons on Dhivehi, the Maldivian language. Children can also entertain themselves by discovering the hidden cave, or playing sports games on the Nintendo Wii. Supervised by an enthusiastic activities staff, parents can rest assured that their children are in caring hands. Whether you are a beginner or a master diver, there is a scuba experience for you. 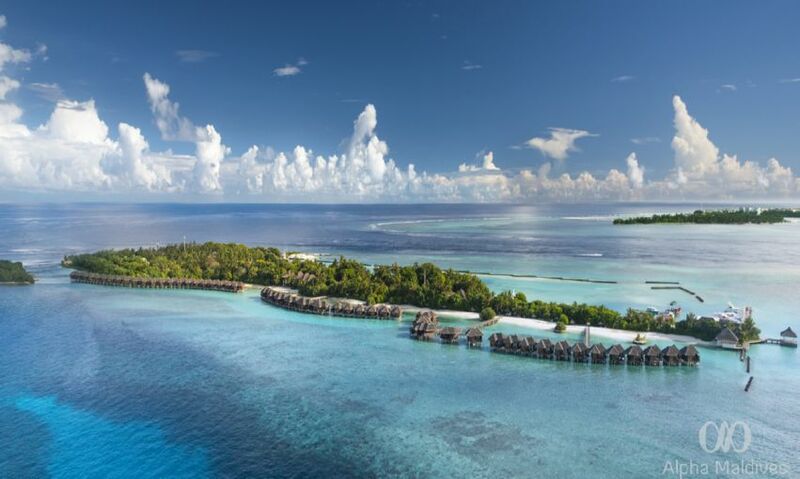 With over 40 world-class diving sites in close proximity to the Sheraton Maldives Full Moon Resort & Spa, the dive centre is a hub for adventure. As one of the most established dive centres in the Maldives, your diving experience promises to be spectacular and sensational. The excursion trips are great highlights, with something for everyone, nature-lover, culture-seeker or sports enthusiast. Choose the Dolphin Cruise; Island Escape; Local Island; Sports Fishing; Male’ Visit or Reef Snorkeling. Hours of operation for day excursions usually fall between 6am and 10pm and are subject to weather conditions. Take a shopping trip to Malé, one of the world’s smallest capital cities. Tour the local fish market, souvenir shops, and religious and cultural sites. Experienced fishermen and first-timers alike can have the adventure of a lifetime fishing in the deep blue Maldivian waters. Sailfish, yellowfin tuna, wahoo, barracuda, and jackfish are common catches. All equipment is provided, and an experienced skipper and crew will guide your exciting trip. You may also be able to enjoy your catch for lunch or dinner. In a country with over 99% water and less than 1% land giving 100% satisfaction to its guests, the possibilities for fun-filled activities in the water are almost inexhaustible. Join in the daily snorkeling trip to some of the planet's best coral reefs and explore the magical underwater world. Stop by the watersports center for a complimentary snorkeling equipment kit to use throughout your stay. Visit amazing island villages that uphold storied traditions. Your friendly guide will provide a better understanding of Maldivian culture. You may also buy a variety of handmade souvenirs as memories of your journey. The most popular trip. 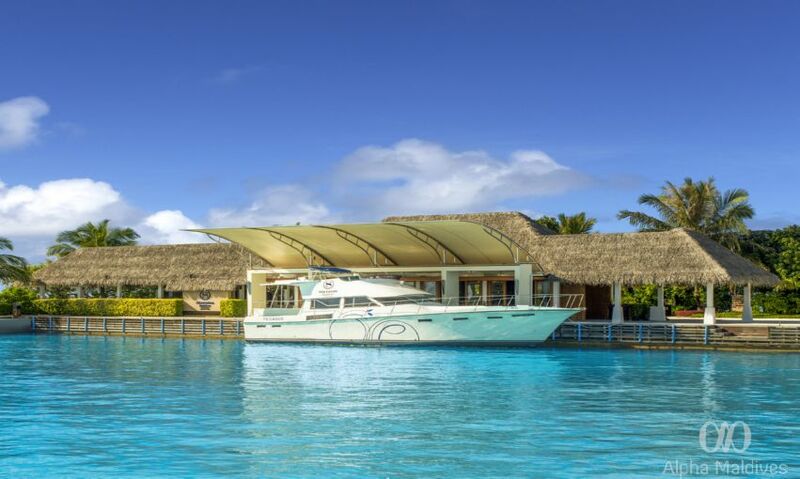 Track the playful and beautiful dolphins that live around the resort from a specially-crafted Maldivian Dhoni. Excursions operate three times a week and last approximately two hours. Remember dolphins are unpredictable wild animals but the team will do the best to track them down. Minimum of eight people required. 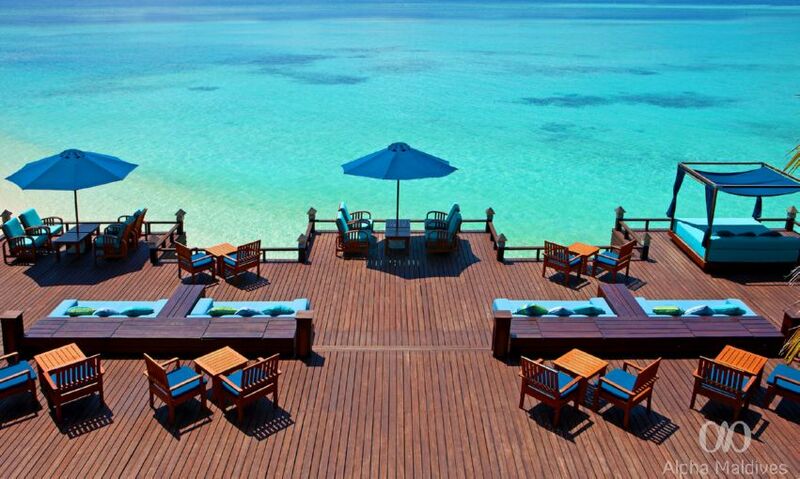 Swim and snorkel in crystal-clear blue lagoons and enjoy a delightful picnic lunch on an Island Escape. Out of respect for Muslim culture on local islands visited on this tour, guests are requested to dress modestly. Island Escape runs twice weekly and is subject to weather conditions. With a wide range of water sporting activities tailored to suit all of guests, the water sports center is a one stop spot for a fun-filled day. Spend the day with your loved ones learning from qualified professionals how to windsurf or sail. Or hop on the banana boat or the ski tubes for a wild ride! The water sports center also feature other water sporting activities for all levels, such as catching the waves with wakeboarding and kneeboarding or taking a more relaxed approach with a casual canoe trip whilst admiring the mystical gems of the Indian Ocean. To experience one of the best surf sites in Maldives, the water sports team is ready to challenge the waves in paradise with you.